"The story of a love that became the most fearful thing that ever happened to a woman." Trailers for the compelling film promised: "Never has a woman been so beautiful, so exotic, so dangerous to know! ", and Gene Tierney (in her signature film role as Laura) delivered with exquisite elegance and sublime, breathtaking beauty the role of the untouchable 'work of art'. [Note: Both Jennifer Jones and Hedy Lamarr had turned down the title role.] A film with the similar theme of a man bewitched with a woman's portrait was Fritz Lang's sad and nightmarish film noir The Woman in the Window (1944). The highly-polished film was nominated for five Academy Awards: Best Director (Otto Preminger), Best Cinematography (Joseph LaShelle), Best Supporting Actor (Clifton Webb), Best Art Direction and Best Screenplay, and it received the award for Best Cinematography. The crisply-written screenplay (by Jay Dratler, Samuel Hoffenstein and Betty Reinhardt) was based on the play and novel of the same name by Vera Caspary. 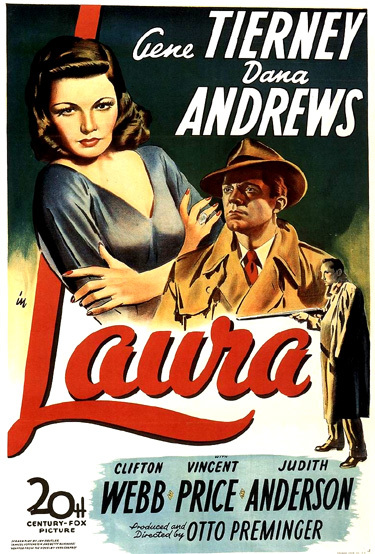 [Though a number of allusions to Lydecker's homosexuality were cut from the script before filming began, the hyper-protective character expressed hetero-like jealousy over anyone else's attention toward Laura, particularly by the detective, even resorting to murdering her to keep her 'pure' and to himself.] The successful novel had previously been serialized in Collier's Magazine (October-November 1942) as "Ring Twice for Laura." During the narrated flashback, the camera tracks from left to right across glass cabinets with beautifully-displayed shelves of priceless objets d'art that are placed in the alcove of his elegantly-expensive, New York City apartment/penthouse. The narration continues throughout the filmed tour, past an Oriental statue, wall-mounted ceramic heads, and a baroque grandfather clock with pendulum (the clock holds more meaning beyond its present context!). I shall never forget the weekend Laura died. A silver sun burned through the sky like a huge magnifying glass. It was the hottest Sunday in my recollection. I felt as if I were the only human being left in New York. For Laura's horrible death, I was alone. I, Waldo Lydecker, was the only one who really knew her. And I had just begun to write Laura's story when - another of those detectives came to see me. I had him wait. I could watch him through the half-open door. (The chiming of the antique clock on the half-hour attracts the detective's attention, and he walks over to it.) I noted that his attention was fixed upon my clock. There was only one other in existence, and that was in Laura's apartment in the very room where she was murdered. McPherson: Nice little place you have here, Lydecker. Lydecker: It's lavish, but I call it home. McPherson: ...you ate a lonely dinner, then got into the tub to read.' Why did you write it down? Afraid you'd forget it? Lydecker: I am the most widely mis-quoted man in America. When my friends do it, I resent it. From Sergeants McAvity and Schultz, I should find it intolerable. (He pushes away his typewriter stand.) Hand me that washcloth please, Mr. __ , Mr. __ ? Lydecker: I always liked that detective with a silver shinbone. McPherson: Thanks. I hope you won't have any reason to change your mind about me. McPherson: You said Harrington was rubbed out with a shotgun loaded with buckshot, the way Laura Hunt was murdered, the night before last. McPherson: Yeah. But he was really killed with a sash weight. Lydecker: How ordinary. My version was obviously superior. I never bother with details, you know. I know you'll have to visit everyone on your list of suspects. I like to study their reactions. If you know anything about faces, look at mine. How singularly innocent I look this morning. Have you ever seen such candid eyes? Lydecker: (callously) Let me put it this way. I should be sincerely sorry to see my neighbors' children devoured by wolves. Shall we go? McPherson: Did you approve of Miss Hunt's coming marriage to Mr. Carpenter? Anne: Why? Shouldn't I approve? McPherson: I don't know. What is your relationship with Mr. Carpenter? Anne: What do you mean? McPherson: What I mean is he's been a frequent guest in your home. Is he an acquaintance, friend? Are you in love with him? Lydecker: This is beginning to assume fabulous aspects. Anne: Oh, shut up, Waldo! What are you driving at? McPherson: The truth, Mrs. Treadwell. Are you in love with him? Anne: Why no. I'm - I'm very fond of Mr. Carpenter, of course. Everybody is. Lydecker: I'm not. I'll be hanged if I am. Anne: Oh, don't be so annoying, Waldo. McPherson: Did you give Mr. Carpenter money? Anne: (laughing embarrassingly) Oh that. I asked him to do some shopping for me. That's all. Lydecker: Shelby's a very obliging fellow. McPherson: For some time also, you've been withdrawing various amounts in cash, sometimes fifteen hundred, sometimes seventeen hundred at a clip. Anne: Yes. I needed that money. McPherson: The day you took out fifteen hundred dollars, Mr. Carpenter deposited thirteen hundred fifty. When you withdrew seventeen hundred, he deposited fifteen hundred fifty. Lydecker: (quipping) Maybe they were shooting crap? Anne: Oh, must I be insulted like this! (She stands, turns, and walks away. )...Shelby needed some money and I lent it to him. That's all. Well, after all, it is my money. I suppose I can do as I please with it. The night of the murder, Anne spent her Friday evening all alone because she hadn't been asked to go to a concert with Shelby. Lydecker: Laura had not definitely made up her mind to marry him. She told me so herself, last Friday when she called up to cancel our dinner engagement. As a matter of fact, she was going to the country to think it over. She was extremely kind, but I was always sure she would never have thrown her life away on a male beauty in distress. Shelby: (To McPherson) I suppose you've heard losers whine before, especially in your profession, eh? To conclude his questions, McPherson asks Shelby to identify the classical pieces of music that were played at the Friday concert [Brahms First and Beethoven's Ninth, later substituted with Sibelius], and whether Shelby has the key to Miss Hunt's country house. When a dame gets killed, she doesn't worry about how she looks. In the living room is a grandfather clock identical to the one in Lydecker's place, and a stunning oil portrait of Laura, the 'murdered' title character. [The human-like portrait was actually a photograph of Gene Tierney taken by studio photographer Frank Polony - and touched-up with a few light brushings of paint.] Without the film's theme music to convey additional meaning to the scene, McPherson sees the portrait for the first time and reacts cooly and bluntly: "Not bad." According to Lydecker, "Jacoby was in love with her when he painted it. But he never captured her vibrance, her warmth." Lydecker: Will you please stop dawdling with that infernal puzzle? It's getting on my nerves. McPherson: I know, but it keeps me calm. This is our table, Laura's and mine. We spent many quiet evenings here together. Lydecker relates a long montage-style series of flashbacks of his times with Laura, who is about 30 years younger. Each of the flashbacks is an idealized construct of her. [Whether the real Laura measures up to his adoring memories is open to question.] He begins with their dining together "the night before her twenty-second birthday. Just we two, happy, making plans for her future." But first, he recalls, from his point of view, when Laura Hunt (Gene Tierney) was still a young aspiring career woman five years earlier when she first approached him in the Algonquin Hotel dining room where he was having lunch. Young woman, either you have been raised in some incredibly rustic community where good manners are unknown or you suffer from the common feminine delusion that the mere fact of being a woman exempts you from the rules of civilized conduct, or possibly both. I don't use a pen. I write with a goose quill dipped in venom.....I'll neither consider, endorse, or use the Wallace pen. I hate pens. If your employers wish me to publish that statement in my column, you may tell them that I shall be delighted to oblige. Lydecker: In my case, self-absorption is completely justified. I have never discovered any other subject quite so worthy of my attention. Laura: But you write about people with such real understanding and sentiment. That's what makes your column so good. Lydecker: The sentiment comes easy at 50 cents a word. Laura: Well, if that's the way you really feel, you must be very lonely. Lydecker: Will you kindly continue this character analysis elsewhere? You begin to bore me. Laura: You're a poor man. I'm very sorry for you. After Laura quickly packs her things and leaves, Lydecker reminisces that he had a sudden change of heart - he remembers how appealing Laura was: "She had something about her, that girl. I had to speak to her again. I had to see her."